Learners from Ndela School doing creative writing. 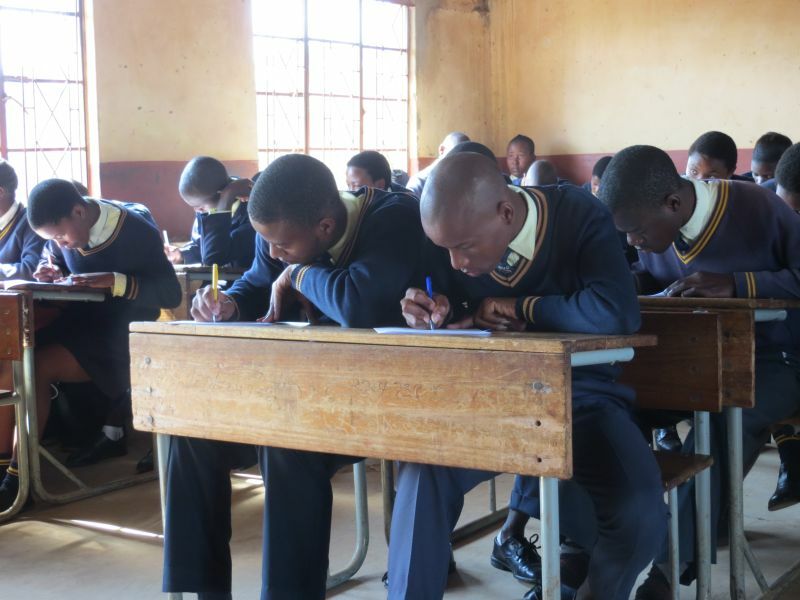 Film maker Mthokizisi Lembethe and Felicity Keats went to Umzinto where Felicity ran right brain workshops for two large classes of learners – the entire Ndela school, in fact. Felicity explained to the HOD that learners are using half a brain in the normal school situation, but that the right brain workshop she runs allows the learners to access a whole brain. This gives them the advantage of a flow of language which is beneficial both in exams and throughout life. Teachers were amazed at the volume of written work the learners produced at this training. Mthokozisi has been filming at Ndela School. He collected in all their stories and is selecting the best. These will be published by umSinsi Press in an anthology for the school. This launch will be included in the short documentary he is making about the school. The video will highlight the excellent creative ability of learners in deep rural areas as it will include some footage of traditional dance taken a few weeks previously.